In addition to the relationship between a centre and its circumference, Watchword’s interpretive structure utilizes a broader analysis of spatial metaphor. Put simply, this means that space (more particularly, position and direction) has important, psychologically meaningful, symbolic associations. Like many mandala symbols, the Watchword matrix is based upon the principle of four, represented by the four primary directions in which an object may move on a two-dimensional surface – i.e., forward (or upward), backward (or downward), left and right. These directions can be represented by the equal-armed Greek Cross, made with a single vertical and horizontal line. The Greek Cross is widely believed to symbolize the radiation of the cosmos from a central point. Since this cosmos may be interpreted not only physically but also psychologically, the Greek cross can also symbolize the radiation of the psyche from the centre of consciousness and personal being. In the Watchword system, the vertical line of the Greek cross, cut in two by the horizontal, signifies the distinction between psychological tendencies that are (1) progressive, superior, or dynamic and those that are (2) regressive, inferior, or static. The horizontal line divides the left and right "hands" of personal being. The left hand signifies the subjective, unconscious inner world, whereas the right hand represents objectivity, consciousness and the outer world. When interpreting psychological dynamics from the Watchword Test, usually only the eleven central "key" words are considered. 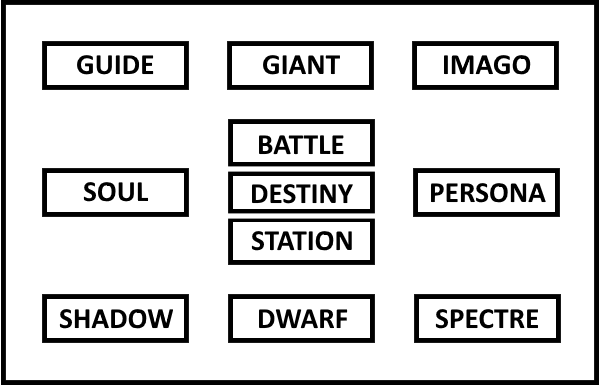 To aid discussion and interpretation, these Watchword Keys are given descriptive names, as shown below. Each of these keys represents a specific psychological tendency (or archetype), based upon the significance of its location within the form. The four primary directions (two principal dimensions) are represented by the Greek Cross formed by Giant-Dwarf and Soul-Persona. The four corner keys indicate the various combinations of these two main dimensions. Thus Guide is the principle of inner progression, Imago is outer progression, Shadow is inner regression, and Spectre is outer regression. Station represents the balance or tension between the inner and outer tendencies of Soul and Persona. 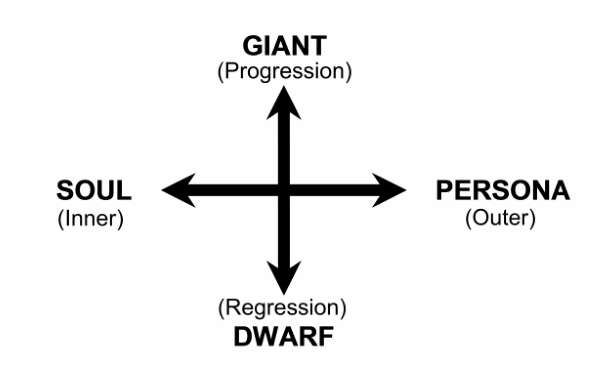 Battle represents the balance or tension between the progressive and regressive tendencies of Giant and Dwarf. Destiny represents a final resolution. Specifically it is the balance or tension between the static form of Station and the dynamic force of Battle. The following table summarises the archetypal principles and primary psychological indications of the Watchword Keys. The Watchword Keys can also be used to identify three major developmental processes.These are (1) Outer Development, (2) Inner Development, and (3) Development of Self. Outer development refers to those processes that lead the person to success, happiness and fulfilment in the material or social worlds. Development generally starts from a position of weakness, alienation, anxiety or difficulty (Spectre). Through the achievement of a stable outer personality, and by adopting appropriate social roles (Persona), the individual may eventually approach his or her consciously realized goals (Imago). Inner development is represented by the sequence Shadow – Soul – Guide. This sequence involves a journey towards deeper knowledge of the inner workings of the psyche. 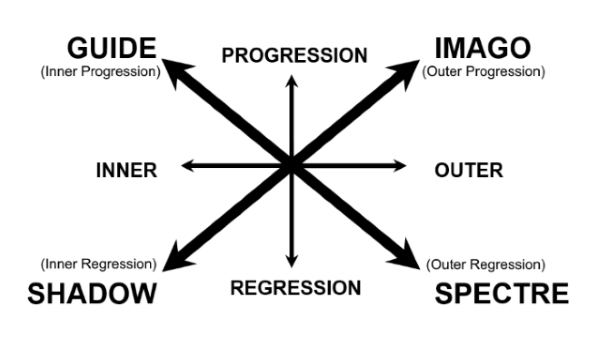 Significantly, the sequence implied in the Watchword matrix is identical with that suggested by Jung in his outline of the process of individuation (see Jungian Dynamics). 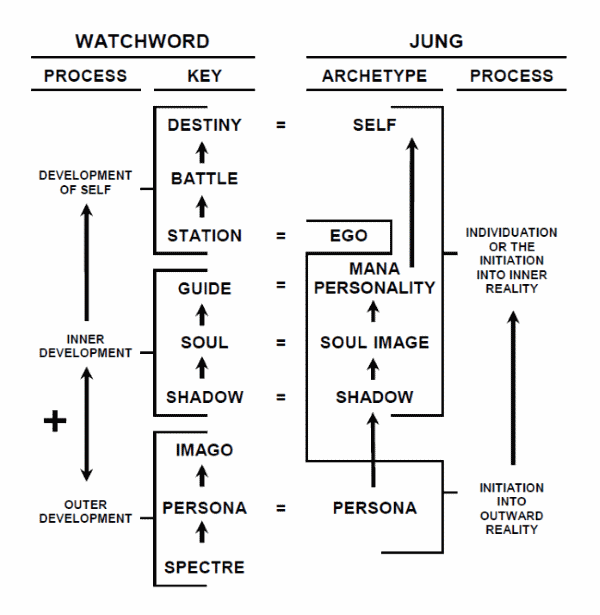 Thus Jung argues that individuation involves successive stages or milestones of development in which the person encounters archetypal images/structures of (a) the shadow, (b) the soul image and (c) the mana personality. According to Jung these three stages of development must precede the final realization of the archetype of the Self. 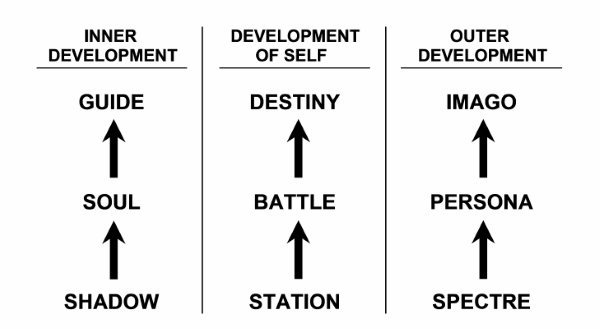 The achievement in some measure of both outer and inner development paves the way for the development of the Self, represented in the Watchword Matrix by the sequence Station – Battle – Destiny. Station indicates our personal axis, our fixed centre, or sense of who we are at this particular time and place. As such, it is more or less equivalent to the Jungian ego. Station is, however, not our final destination. Rather it is the starting point for the our journey along the path towards full self-realization. 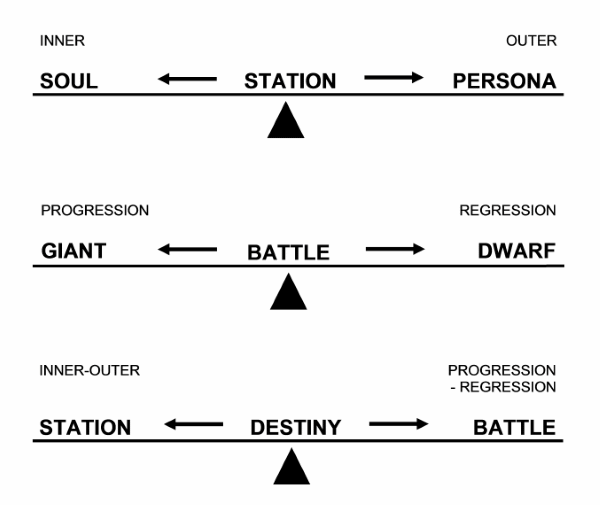 This journey almost always takes place against a backdrop of conflict and opposition (represented by Battle). The anticipated final destination and resolution of our personal battle or quest is represented by Destiny. Interestingly, very often the word written at Destiny represents a quality associated with the realized Self. There are remarkable correspondences between the Watchword and Jungian models of the psyche and psychological development, with many of the Jungian archetypes having direct parallels with particular Watchword Keys. 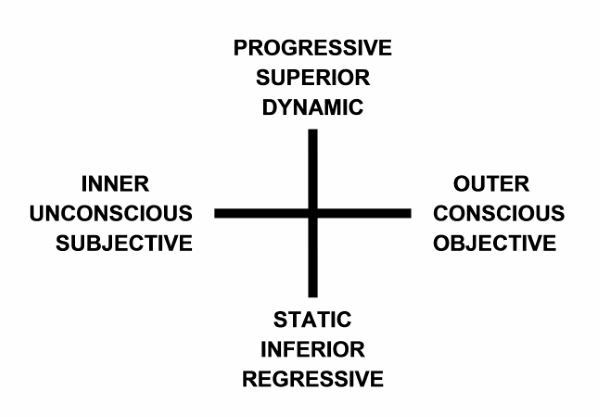 The developmental processes indicated by the two models are also very similar, although Watchword implies that aspects of outer and inner development occur simultaneously, rather than occurring at different stages of life.This reflects the fact that the Watchword Test provides a snapshot of the forces and processes that are currently active in the psyche, rather than a longer-term analysis. In practice, this means that Watchword's psychological diagnosis can be expected to alter over time, or whenever a sudden change occurs in your situation. Sometimes it is possible to track meaningful day-to-day changes, although generally the Watchword Test provides fairly consistent results over periods of weeks or months. 1. The Indian mandalas generally present a plan view of the cosmos (i.e., as seen from above). 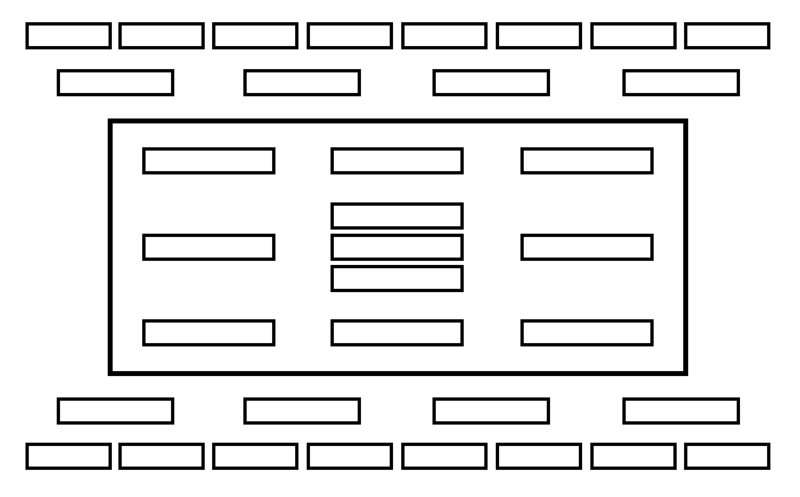 The Watchword Matrix, on the other hand, is an elevation view (i.e., as seen from the side). 2. The basis for these symbolic association are fully explored in Self-Discovery the Jungian Way: The Watchword Technique (Daniels, 1992; 3rd revised edition published 2014).